In conjunction with UNESCO George Town World Heritage Site 10th Anniversary theme: Po-TEN-Tial “Of the Past, In the Present, For the Future”, Cultural Heritage Book Gifting Programme is launched. Through this programme, George Town World Heritage Incorporated (GTWHI) hope to cultivate young peoples’ knowledge and interest in Penang’s cultural heritage. 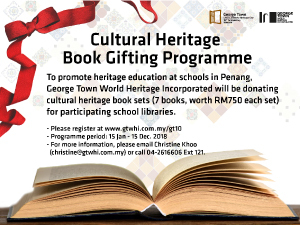 With this aim in mind, GTWHI will donate 100 sets of cultural heritage books valued at RM 750 per set to educational institution ranging from secondary schools, colleges to universities in Penang. Each institution is entitled to receive one set of books.